Why is ad block making browsing ugly???? can you remove them in the next update? That is not an ad it's just the website displaying an image and some text to (forcefully) request you to not use adblock on their website. I advice you to whitelist the website in the AdblockPlus options (or put it in the trusted site tab, not sure how it's called in the English version). Either that or switch to a different website or download torrents instead of using streams of video hosting websites. If you need any help just PM me. You can try to add anti adblock filter or if you have greasemonkey extension, try to add anti adblock killer script. If that is the case then why did AdHunter hide the ad and the "hide" text? Considering that ABP is supposed to better it seems pretty poor that it can't do something as well as what AH did. I've even tried using the FF version and creating a rule using the options in that, and no matter what I tried to do it just couldn't remove the hide tags. In AH the rule that removed all those elements (IIRC) was */ad/*, adding the same to ABP doesn't work. 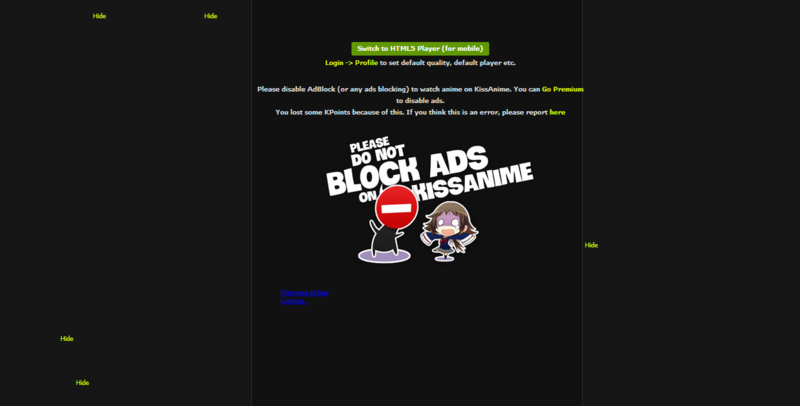 They're usually pretty quick when it comes to rectifying anti-adblock annoyances. Anti-adblock scripts actually rely on the script being blocked to trigger the warning. They name the script something they know will be blocked like "***advert.js". Therefore the fix is creating a rule to allow the script (and only the script) to run. Adhunter also occasionally triggered these warnings, but since it blocked a lot less by default, it happened a lot less. Also, if it's a popular site, there's a good chance it's already been fixed if you force an update.